Today’s menu comes courtesy of my husband. He’s really great at grabbing some random ingredients and creating a masterpiece. Today’s meal is no exception. Fish is one of our favorites when the budget allows for it. This meal is a great way to celebrate a special occasion, or a just because day. We hope you and your family enjoy it as much as we did. Keep scrolling to the bottom to see our dessert bonus! 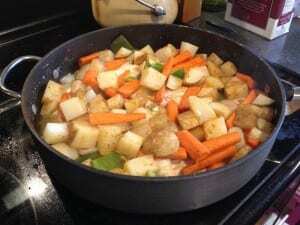 Cut potatoes into small cubes, and the carrots into sticks. Steam these vegetables together on the stove for about 20 minutes. Cut and onion and a green bell pepper into chunks. Pour 1/4 c. of oil in the pan, lay your salmon out in the pan, add salt and pepper to taste, layer the pepper and onion on top of that, then add the potatoes and carrots lasts. At any point in this process, add approximately 1/3 c. of white wine to the pan. Finally, add salt and pepper to taste and add in some Old Bay seafood seasoning. Toss the vegetables around and cook at 425 degrees for 25 minutes. For dessert we added a little pumpkin cake to the menu. It seems as though everything has pumpkin flavor added to it this time of year, but this is a play on the traditional spice cake with a twist. While this is not a completely clean dessert, you could adapt it to fit your needs or desires. We typically try to eat clean, whole foods, but a treat every now and then is not going to hurt anything. Granulated sugar could easily be replaced with coconut sugar, and the flour could be replaced with a cleaner version as well. I did not bake this cake as long as the original recipe called for, simply because we like our desserts a little gooey in the middle. The texture was very spongy and moist. 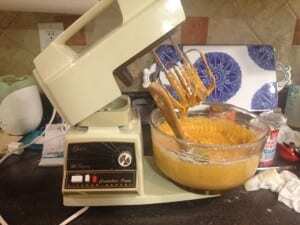 An added bonus was that I got the chance to use my grandmother’s mixer for the first time in a really long time. That makes everything taste better, right?! Preheat oven to 350 degrees F. Spray a glass cake pan (8″) and set it aside. 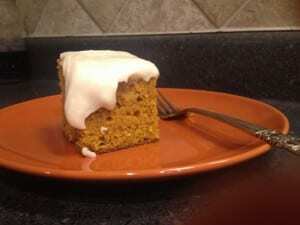 Mix pumpkin, yogurt, sugar, egg whites, and vanilla together until mixed well. 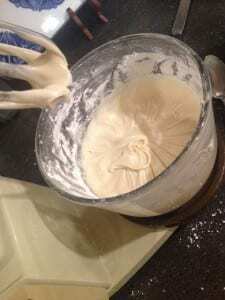 Then add in the remaining dry ingredients. Bake for 20-30 minutes (depending on how done you like your spice cake). 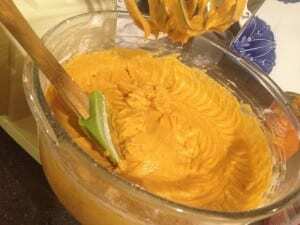 While it’s baking, you can mix your ingredients together for the frosting. Once the cake is done and cool, spread the frosting on top and serve! This was a delicious treat! 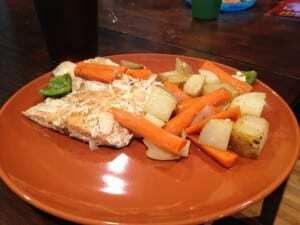 We hope your family enjoys this Monday’s Menu – One Pan Salmon. Please share with us how your family enjoyed it.